SOLD OUT - Stay tuned for the new collection! Aromatic vapors gently diffuse though the fine wreath of leaves on the sides of this locket. Just place a fresh wick inside, add a few drops of your chosen essential oil, and simply breathe. Soothing to the touch, this smooth, sensuous design has a remarkable calming effect when you touch it. 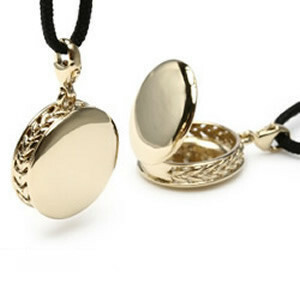 Sample lockets have been previously admired and tested and may have some surface scratches or minor imperfections. Catches may be slightly loose fitting but all are 100% functional. Finished your purchases? Click here to VIEW CART/CHECK OUT.